From an acclaimed musician comes an inside look at one of the most controversial and influential civil rights movements of our time. 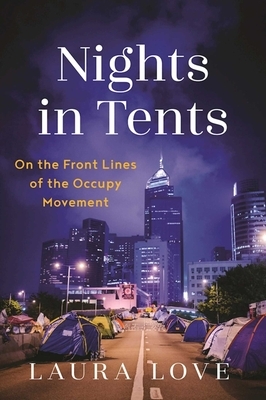 Nights in Tents is a memoir of the profoundly moving, and often hysterical, circumstances a fifty-one-year-old middle-class musician encountered when she abandoned a pleasantly predictable life on her pastoral, off-grid home nestled in the Cascade Mountains of Washington State to run off with the Occupy Movement. Internationally recognized singer/songwriter, Laura Love, put her music career on hold for a year to live in the chaotic tent encampments from Wall Street to Oakland. Traveling through the United States, Laura was immersed in the electrifying political culture of Occupy. She pitched her tent on city center concrete plazas; she helped shut down the Port of Oakland; she took over a Bank of America in San Francisco and was teargassed, arrested, and jailed for her trouble. All the while, she formed close bonds with the disparate characters who make up the 99 percent. Love’s insight into the importance of this moment in history, as well as her surprising predictions about the next phase, promise to inspire and enlighten. This lively, engaging account takes the reader on a journey that will captivate fans of political humor, women’s interests, African American perspectives, LGBT stories, as well as fans of narrative nonfiction and the memoir in general. Laura Love is an acclaimed African American singer/songwriter who has released twelve CDs since 1990 and has toured internationally over the past twenty-five years. She grew up in Lincoln, Nebraska, in a chaotic household with her sister and an unstable mother. Eventually, she fled to Seattle, where she built an independent music career, catching the attention of industry giant Universal Records. Laura released two praised CDs with Universal before returning to her roots as an independent artist. Her first memoir, You Ain’t Got No Easter Clothesa recounting of her traumatic childhoodwas published by Hyperion Books in 2004. She lives in Seattle, Washington.